Jon took a couple of days off this week and we enjoyed some family time outside with the girls. 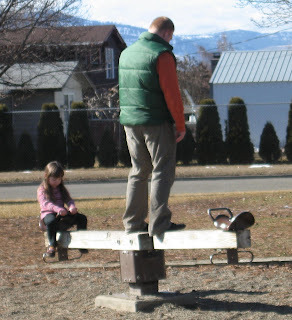 We went to the park in Ellensburg and found out that we have a couple of fearless girls when it comes to climbing on the big toys. They had a blast and Adelyn kept up with her sister like a champ considering those little legs aren't as long and limber as Delaney's quite yet. They were so entertaining to watch we can't to take them again soon. Jon likes to change his own oil in our cars. 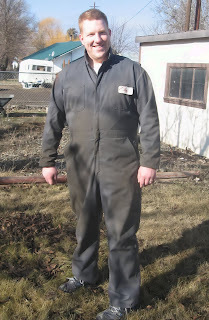 He even has a pair of mechanic's overalls with a Jon nametag he got at a carshow with his Dad. I realized that all the times he has changed the oil I had never taken a picture of him. He looks so cute yet manly while he's taking care of business! It was Jon's birthday on the 19th and the girls wanted to make sure it was a special day for Daddy. We got him football cupcakes, and made his favorite Rootbeer floats! 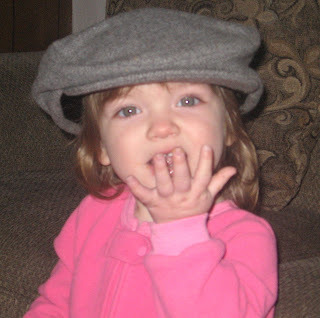 Delaney also helped pick out a new dapper hat for Daddy to wear to work to keep warm. The girls liked to wear it too. It was a big hit! Jon felt that he was spoiled pretty good and that meant that us girls did a job well done.